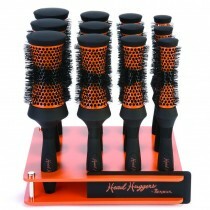 Improve the retail displays and POS in your salon with a range of hair brush display stands from top names including Cricket and Denman Squargonomics. Showcase some of the best hair brushes on the market in an attractive and easy-to-view manner, with the stands capable of holding various different size of brush. Simply placing a couple of these hair brush display stands on your reception or payment area could encourage clients to make extra purchases on top of their treatments, which means more money in the till for you.